The clash of Asdee and Ballylongford is sure to draw the rival supporters out in their numbers in this eagerly awaited County Novice Shield Final which will go ahead on Sunday 13th at Stack Park, Ballybunion with the throw in time of 2 30pm. Certainly this is an unique occasion as it puts into opposition fellow parishioners and to add to the occasion the majority of the players involved have played together at under age level. There is no doubt but that Bally will enter the game as firm favourites and in recent clashes would seem to hold the Indian sign over their opponents; the most recent clash was in the North Kerry League where Asdee held an 8pt advantage at the interval but were eventually to go down by a 1pt margin. Bally were to go on to win the North Kerry Division 2 league title. In this competition leading up to this weeks final Bally laid down a marker with a victory over Beale while Asdee had to endure anxious moments after extra time to oust Clounmacon at the quarter final stage and then went on to defeat Renard in the semi final. So can Asdee who are struggling in Division 5 of the County League, numbers limited and forced to field without at least two of our most influential players out through long term injuries take on a Bally side who are playing in a Division above us and are enjoying much better results. Certainly it promises to be an intriguing encounter. Both teams can have match winners on any given day; For Bally probably who is one of the top and skilful footballer Kieran “Kiki” Mulvihill can cause plenty problems for the best of defenders, Joe McCarthy is another but the loss of Eddie Mangan injured is a huge blow. David Culhane has worn the green and gold with distinction and Kenneth Sheehy will play around the middle while Michael McEllistrim if available and Daniel Lane can hold their own in a tight marking defence. 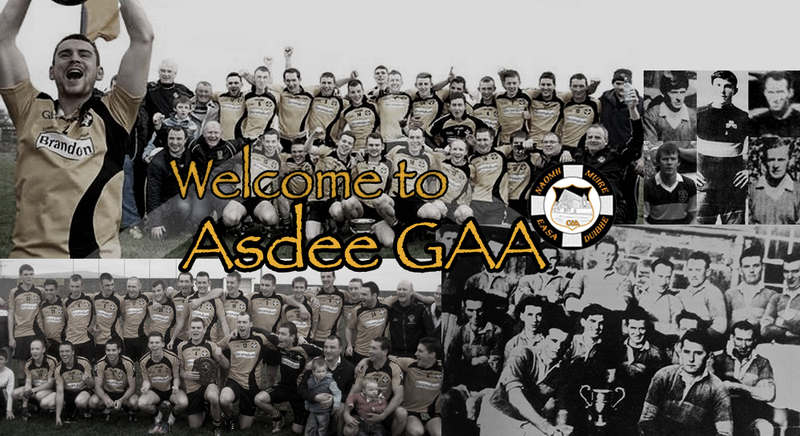 Asdee will be looking for top displays from our midfield pairing of John Doran and Padraig Ruddle and if they can hold their own then Eoin Kennedy, Darren Russell and Mike Breen could very well point the Black and Amber to an historic victory. Eoin O Carroll and the younger brigade of in form Sean Keane and Kieran Kelly wont be found wanting in the Asdee rearguard. So who will become County Champions; as already stated Bally would seem to hold all the aces but in fairness when it comes to a final and especially a local derby the game could swing either way. Everybody is expecting a tough struggle but when all is over may the best team come out on top with football to be the outright winner.